History doesn’t repeat on the first trading day the year… 55,000 acts of New Year’s lawbreaking in New York… Rickards pro and con… and more! One of the biggest beneficiaries of the “Trump bump” late last year turns out to be one of the biggest Hillary Clinton supporters — Warren Buffett. 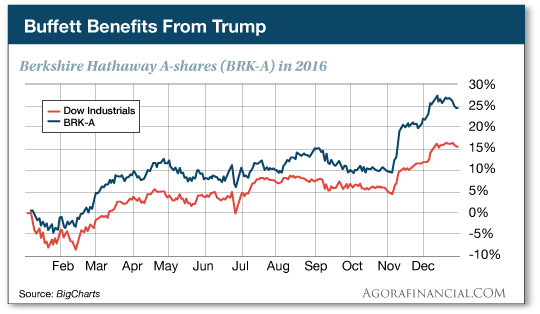 In a sense, BRK powered forward after the election for the same reason it’s been a juggernaut the last five decades. Media accounts of Berkshire’s “Trump bump” tend to focus on the Berkshire units set to benefit from Trump’s policies: The aerospace equipment maker Precision Castparts might get more orders. Phillips 66 might benefit from an administration more friendly to fossil fuels. Wells Fargo and Buffett’s other financial names will presumably be better off with rising interest rates. Chris says that ability to invest in anything is one of two key factors behind BRK’s success. The other is permanent capital. “Investors are a skittish lot,” he explains. “They tend to pull money out of funds after the market has fallen. If you’re running a fund, it means you have cash going out the door when the opportunity set is richest. Put those two factors together and you have the single strongest performer of Chris’ exhaustive research into “100 baggers” — stocks that turned a $10,000 investment into at least $1 million. In the case of BRK, a $10,000 investment in 1965 was worth $182.6 million by 2014. Berkshire has been the model for similar companies, some of which might be familiar to you — Markel, Fairfax Financial Holdings, Loews Corp., Icahn Enterprises, Leucadia National. “There is another smaller one you may not have heard of,” says Chris: HC2 Holdings (HCHC). “This is an investment vehicle run by Phil Falcone, who owns 11% of the stock. “Falcone is a talented investor who ran a publicly traded vehicle called Harbinger, which more than doubled under his four-year reign. But you may know him best for his past legal troubles with the SEC and communications company LightSquared (now rebranded as Ligado Networks). That’s just one possibility. There are others that are even more attractive. For the past three years, Chris has been developing a blueprint for finding early-stage companies that share the key traits of Berkshire — permanent capital, the ability to invest anywhere and a talented investor at the helm. Thursday night at 8:00 p.m. EST, he’s holding a free investment master class to show you how it works — and how you it can vastly improve your investment returns. You’ll even get names and tickers of six stocks on his watchlist. Because Chris was once part of the Agora Financial fold, we’ve pulled some strings at Bonner & Partners to give you free access to this master class. Sign up at this link and you’re in. So the first trading day of 2017 is not at all like the first one of 2016. A year ago, traders came back from holiday break on Jan. 4 and decided the economy was too weak to withstand a recent interest rate increase by the Federal Reserve. The market fell out of bed that day. For the next six weeks, it tumbled down the stairs, out the front door and into the street, where it got run over by a passing car. The Dow lost nearly 1,800 points. This morning? The Dow is up more than three-quarters of a percent as we write, at 19,920. Small caps are up even stronger, the Russell 2000 rising 1.25%. The “risk-on” environment means a sell-off in Treasuries, the yield on a 10-year note back to 2.51%. But gold is holding its own, hanging onto its gains from late last week at $1,150. And crude is up more than 2%, knocking on the door of $55. That’s another 18-month high. The big economic number of the day is the ISM Manufacturing Index. At 54.7, it’s the strongest in two years. A year ago, it was 48.2 — below the 50 dividing line and signifying a shrinking factory sector. 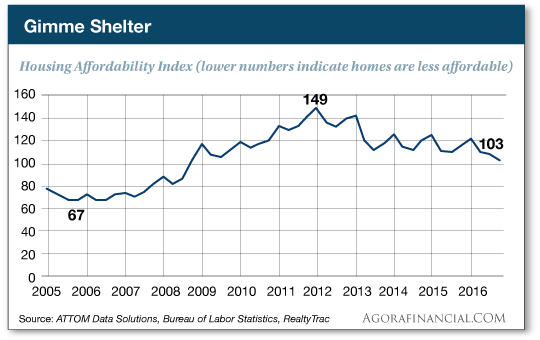 And then there’s this lesser-followed economic number: Housing in the United States is its least affordable in eight years. That’s according to the quarterly Home Affordability Index from ATTOM Data Solutions — which takes its own sales deed data from 447 U.S. counties and combines them with wage data from the Labor Department. Surprises turn up in a couple of metro areas: Denver and Adams counties in Colorado come out looking good on the affordability index. But the Dallas-Fort Worth area is looking a little bubbly. The big takeaway: The national median home price has shot up 60% from its bottom in 2012… while average weekly wages have grown only 1%. Nope, no inflation here! In the technology space, Ray Blanco’s big call about virtual reality last year was spot on: His primary play on the trend, Nvidia, nearly tripled in 2016. As 2017 opens, Ray writes us from the Consumer Electronics Show in Las Vegas… and he says this year is about autonomous technology — a term that most people take to mean self-driving cars. But that underplays the significance. “This is a huge, long-running trend,” says Ray. “In fact, it’s been around since the beginning of the Industrial Revolution, when humans first began replacing muscle power with machine power. “But now, with the improvement in processors, sensors, actuators and the programmatic algorithms that tell the machines what to do, the process is accelerating. We aren’t just replacing muscle these days, we’re replacing brains. Prohibition in action: Despite the heavy hand of the law and a digital paper trail with every transaction… Airbnb had a record New Year’s Eve in New York. Big Apple hotels lobbied hard for the law; naturally, they don’t like the competition from Airbnb, the site that links up travelers with people willing to rent a spare room. Heh… Hotel executives can’t be happy to open the New York Daily News and see that Airbnb says it had more than 55,000 New Year’s Eve rentals in New York — up from 47,000 the year before. “I just love Jim Rickards’ comments,” a reader writes as we tie up unfinished business from the year gone by. “He seems so smart and interested in providing logical and important information. “However, when I look at the numerous losses in his premium services, I have finally stopped following him and have not chosen to enroll in another of his ‘important’ programs. It’s time to tell others the truth about his losing recommendations. Failure to reveal shines poorly on your other good advisers and the company as a whole. “I think a lot of the criticism that Jim Rickards has been getting is unfair,” a reader writes. “I have physical gold, although not as much as I would like, as well as stock in some very underrated gold and silver mining companies, and have no intention of selling any of them anytime soon. “If you’re looking for Rickards to tell you that at 3:15 p.m. EST on March 13, 2017, gold is going to take off and shoot to the moon, then you have the wrong person and wrong publication. May I suggest calling the Psychic Hotline? “No one knows what the date is going to be, only that it’s going to happen eventually. And IT HAS TO HAPPEN. There is simply too much debt in the world, too much money printing and far too many socialist politicians spending money that they don’t have and stealing from future generations, who will soundly curse them for their actions when they become old enough to understand the situation. “I happen to agree with Jim’s prediction about precious metals rising,” writes a third. “I’m a little skeptical about the $10,000 level, but hopeful. “The key point, I believe, to what he is saying is that gold, like any other commodity, is going to go up and it’s going to go down in price. If you look at middle term, say, a one-year chart, gold is still higher today than it was a year ago. It’s only going to take a couple of missteps by our new government and we could well see a total loss of value in the dollar, which will send gold, the money, into orbit. If that $10,000 level is hit, I know I’m going to make more than a few dollars, but in the meantime, I’m being patient, still collecting gold, the commodity, whenever I can and holding gold, the money, waiting for the eventual fall of the dollar. “What we have in Obamacare,” writes our final correspondent on a different topic, “is a government-sponsored cartel, not a health care system. The 5: Amen. And we have zero confidence Trump and a Republican Congress will come up with anything to reduce costs. Shift costs, yes. Reduce costs, no…. P.S. If you trust the incoming president and Congress to “repeal and replace” Obamacare without making matters worse or raising your costs… well, besta luck. If, however, you share our skepticism… we urge you to check out the details of an “underground” health care system that’s saving people like you up to $11,172 or more every year in insurance premiums… while taking back control of all their healthcare decisions. Intrigued? Check out our latest research right here.